My husband and I both love popcorn; buttered, kettle, caramel or cheese, we love it all. When The Food Hunter asked me to review the G.H. Cretors Popcorn, I jumped at the opportunity. A family owned business dating back to 1885, G.H. 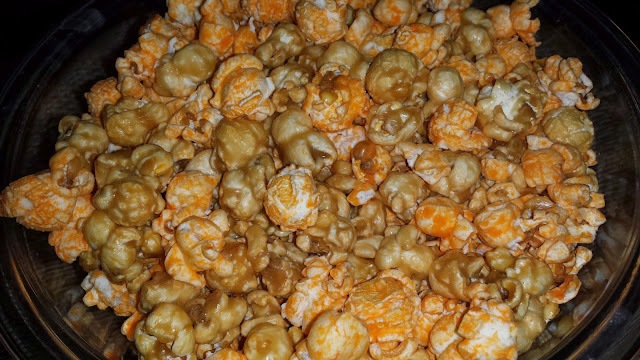 Cretors is some of the best popcorn we've ever tried. One thing I genuinely enjoyed about this product is that it is all-natural and contains no corn syrup, or artificial flavors or colors. This is definitely a plus in my book. I sampled three varieties; Just the Cheese Corn, Just the Carmel Corn and the Chicago Mix- the G.H. Cretors creation that is a combination of the two. Made with real cheddar cheese, the cheese popcorn had a nice salty, savory flavor and is exactly what I want in a cheese popcorn. A bit on the crunchy side, the caramel corn was coated perfectly with sweetness. Though good on their own, together in the Chicago Mix they made the perfect duo of sweet and salty that we all crave. G.H. Cretor Popcorn is available locally at Sprouts, Costco, Total Wine and on-line. If you’re a popcorn connoisseur, I would highly recommend getting your hands on this yummy popcorn...you will not be disappointed.